Listen to "The Malta Exchange: A Novel" on your iOS and Android device. 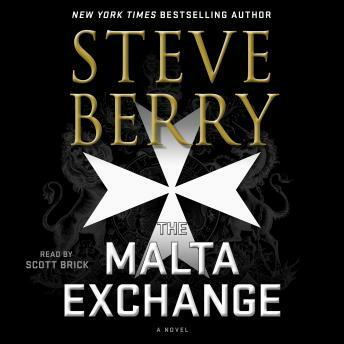 In this audiobook, Steve Berry and Macmillan Audio team up again to bring listeners an expanded, annotated Writer's Cut edition of The Malta Exchange. This Writer's Cut edition features fascinating behind-the-scenes commentary read by the author. Critically-acclaimed and award-winning narrator Scott Brick returns to his role as Cotton Malone - eponymous hero of Berry's iconic New York Times bestselling series - as he enters a deadly race for the Vatican's oldest secrets. The knights have existed for over nine hundred years, the only warrior-monks to survive into modern times. Now they are a global humanitarian organization, but within their ranks lurks trouble - the Secreti - an ancient sect intent on affecting the coming papal conclave. With the help of Magellan Billet agent Luke Daniels, Malone races the rogue cardinal, the knights, the Secreti, and the clock to find what has been lost for centuries. The final confrontation culminates behind the walls of the Vatican where the election of the next pope hangs in the balance.